Homemade pasta recipes are fairly straightforward, though there is some variation on exact ingredients. Our basic handmade pasta recipe includes six ingredients. Mario Batali’s recipe includes flour and eggs while Lidia Bastianich uses flour, eggs, extra virgin olive oil, and ice water. Linda from the excellent site, Ciao Ciao Linda, uses equal parts semolina and white, unbleached, flour (along with eggs) – her family is from Emilia-Romagna and this a standard fresh pasta recipe from the region (semolina provides more texture and “al dente feel” to homemade pasta). Homemade pasta, when made exceptionally well, can be a transcendent experience, including a lovely, and light, mouth feel. However, homemade pasta isn’t always better or superior to exceptional dry pasta. In fact, there are many pasta dishes (given specific condiments or sauces) that shouldn’t be made with fresh pasta. Homemade pasta used to be a strictly northern Italian endeavor though as economic conditions have improved slightly in post War Italy you can find southern Italian home cooks preparing handmade pasta as opposed to purchasing the dry variety. Our specific homemade pasta recipe is derived from a woman who hails from Northern Italy in Liguria (specifically the port city of Genoa) and is used primary for making tagliatelle, fettuccine, pappardelle, ravioli, and tortellini. Dust a large, clean, wooden cutting board (or on a clean work surface like marble or granite) with flour. 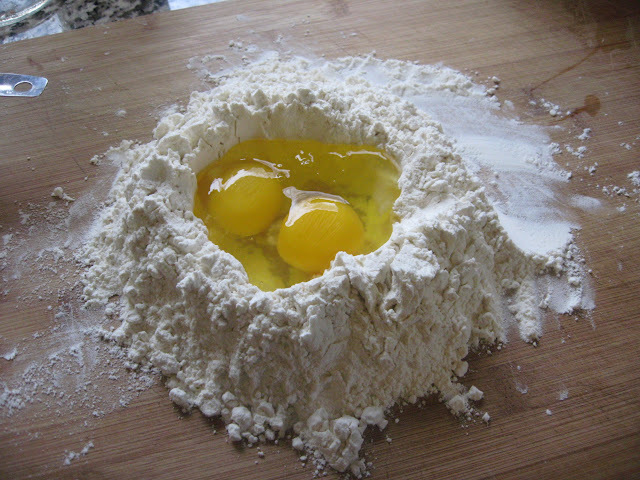 Take your flour and create a “mountain” with an empty center or well. Crack the eggs into the well and beat carefully. Next, add the olive oil, salt, water, and baking powder and beat to mix/combine well. At this point, begin to slowly incorporate the flour from the side of your well. You can use your free hand to gently push the exterior of the flour mountain towards the wet center, but after a few times making fresh pasta you’ll simply learn to incorporate the flour from the interior sides of the flour mountain. The flour will eventually become one with the wet ingredients and you’ll have no use for your fork; at this point you’ll begin kneading the dough (we knead for about 5 minutes, consistently folding over the dough and working it with our palms). After a five minute knead, the dough should feel smooth and have a consistent make up. Thereafter, place a large bowl over the dough and let it sit for 60 minutes (it’s all about letting those glutens relax at this point). Note: you can mix the ingredients in a stand mixer but I encourage folks to learn the traditional method and thereafter switch to mixing the ingredients with a stand mixer (if they prefer a faster and less hands on process). Next, your ready to cut the pasta! I usually cut about 1/4 of the dough and begin flattening it by hand and thereafter use a wooden pin to extend the flattening process (using plenty of extra flour). Next, I’m ready to use our Imperia, hand cranked, pasta machine which includes three options for use: 1. a roller with seven thickness settings, 2., cutter for tagliatelle and 3., cutter for fettucine. I usually run the my dough through the roller up through thickness setting five or six depending on what pasta I’m making (for example I’ll stop at 5 if I’m making ravioli and go to 6 or 7 if I’m making tagliatelle) and then cut (again using plenty of extra flour to keep things from sticking). After the pasta is cut, you’ll need to set it aside to dry. You can hang the pasta on, say, a wood clothes dryer or simply make pasta nests (with a good dusting of flour); I prefer the simpler pasta nests technique. You can store fresh pasta for 1-2 weeks but make sure you dry the pasta well prior to storing it in an airtight container. We usually cook the fresh pasta right away and often make a batch of pesto or fresh pan tomato sauce. Fresh pasta cooks fairly quickly so make sure you have plenty of boiling water and that you stir, with a gentle arm, very often. Thanks for the post. I presume the baking powder is to make the texture lighter. If you want to omit the baking powder, which I would, you might try using 2 separated egg yolks and not adding the whites. The yolks will still be a perfectly good binder but the pasta will be more pillowy and soft, whereas the whites make things more stiff and rubbery (if that’s okay, keep the whites). Also, unless you particularly enjoy coating your shoes with flour or just must use the well method for nostalgia, the initial mixing can be done in a mixing bowl or stand mixer without untoward effect. Resting the dough is critical as you mentioned, though if you’re in a hurry, you can probably get away with a shorter rest period (20-30 min may suffice). The other important point with fresh pasta is, don’t bother saving the cooking water to add to your sauce. It doesn’t have the same effect as you get with dried pasta. Thanks for the comment! I think you’re correct about the use of the baking powder (and given that we’ve adopted the recipes I can’t answer definitively but I encourage folks to try the baking powder as an ingredients because, as I pointed out, if homemade pasta doesn’t have the right texture and airy quality it can be pretty horrific). Good tip with the egg yolks, I’ve tried both methods (I prefer the whole egg, especially when we’re using just plain flour). When making homemade pasta you want a balance between a light and airy texture (sort of soft) but with the right “al dente” texture (it’s pretty common to find homemade pasta that is to soft or chewy and kind of like a wanton or Asian noodle; this, in my humble and respectful view, is not Italian pasta). Yes on the stand mixer! Although I think home cooks should try the “mountain” technique at least once! Great, have a nice time!